I happened across a big flock of geese in a field in northern Colorado a few days ago. Normally I wouldn’t pay it any attention as the Canada Geese are so common, and indeed, somewhat overwhelming at times. 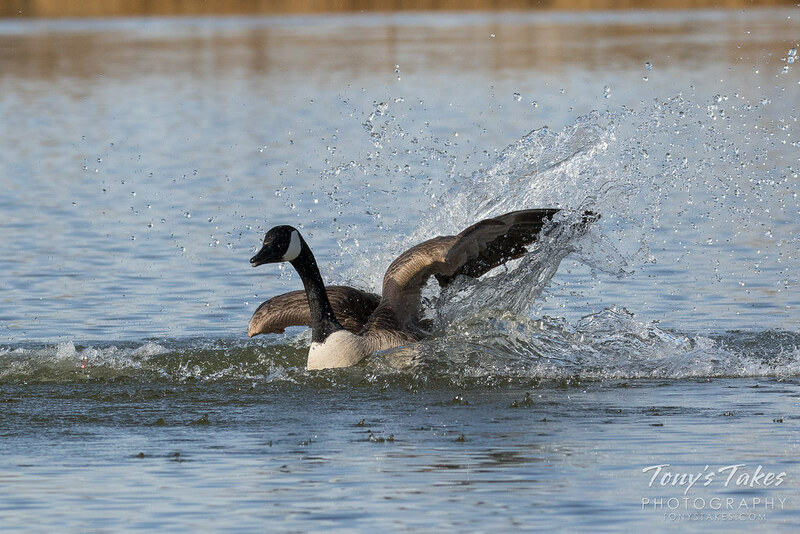 However, there was one goose in particular that didn’t quite fit with the flock – a Snow Goose. While we do see these here during migration, most don’t hang around long. Apparently this guy decided he liked the company of the Canadians better than his own kind. How many geese can you fit into one photo? 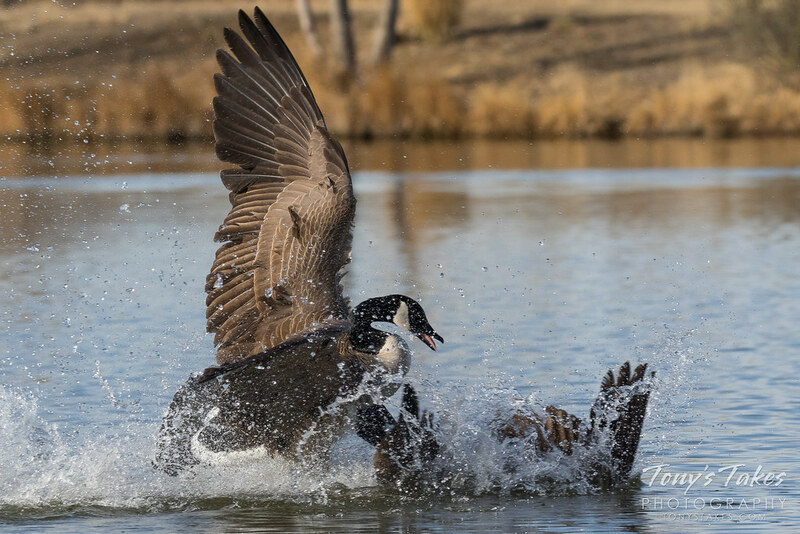 During the winter and spring, the Colorado plains are home to an incredible number of Canada Geese. 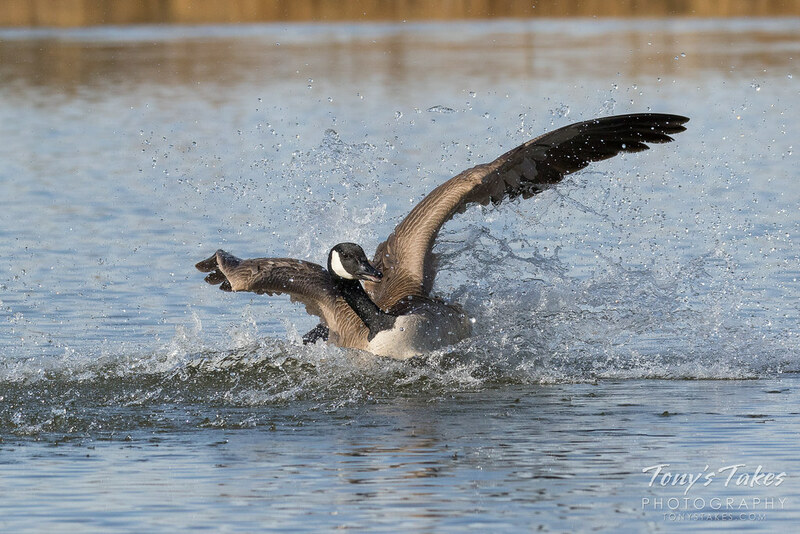 This image captures maybe a quarter of one of a series of groups that came in and landed at Barr Lake State Park this past week. Most are Canada Geese but you do see some white ones in there which are likely Snow Geese or Ross’s Geese. I don’t post these pics because they are particularly great but rather because they show a pretty insane scene. I was out on a photo drive northeast of Denver, Colorado and had stopped to at a popular eagle spot. 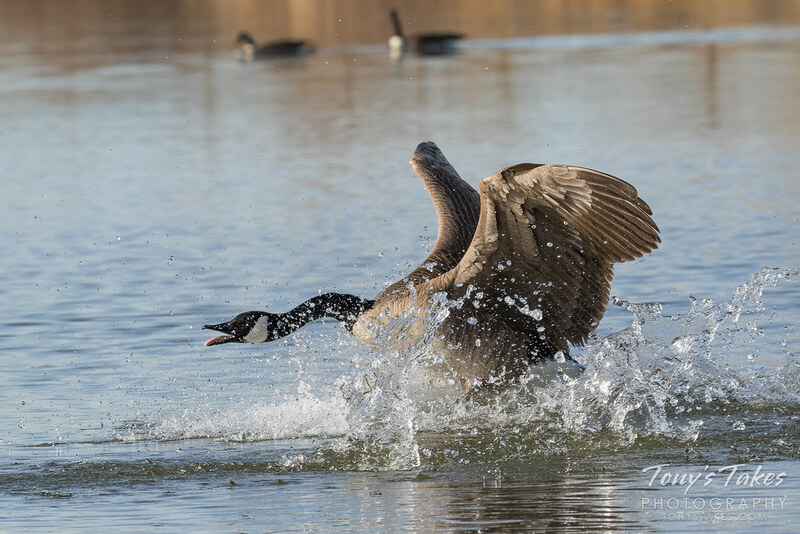 I was hearing a few shotgun shots, not unusual this time of year, when suddenly there was a massive eruption of Canada Geese (and a few Snow Geese) from the nearby fields. There had to be thousands of them as they all took flight, making quite a ruckus as they did. These birds are not particularly well liked in this area as they make huge messes and their numbers can be overwhelming – as you can see – but it was kind of fun to see this. 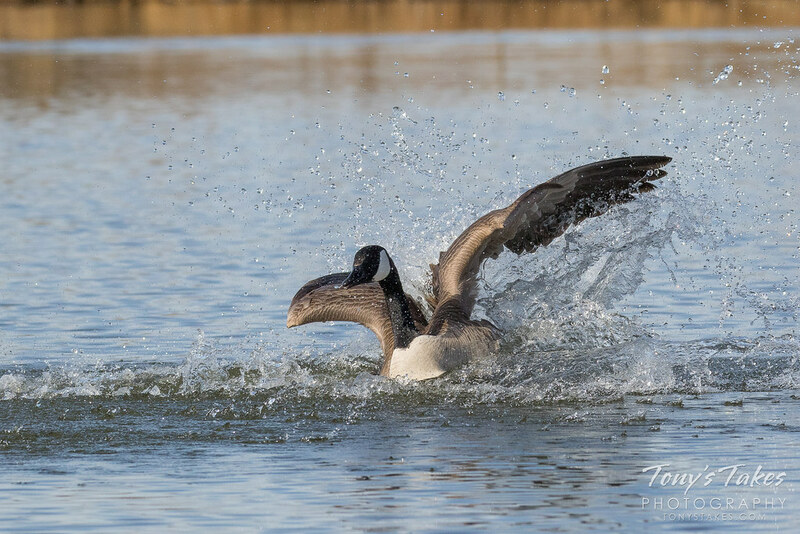 I was sitting observing a pair of my favorite bird (you know what kind) when there was suddenly a bit of action right in front of me. 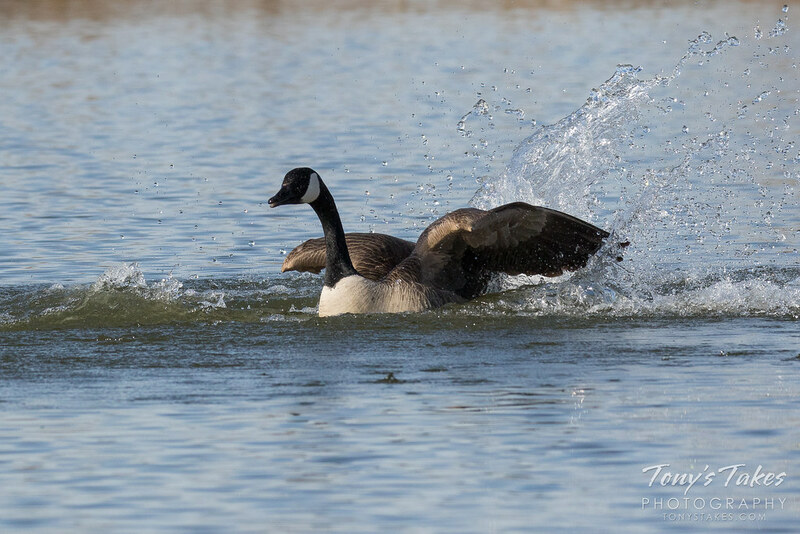 One Canada Goose had decided to claim a section of the pond as its own and wasn’t willing to let any other geese in. 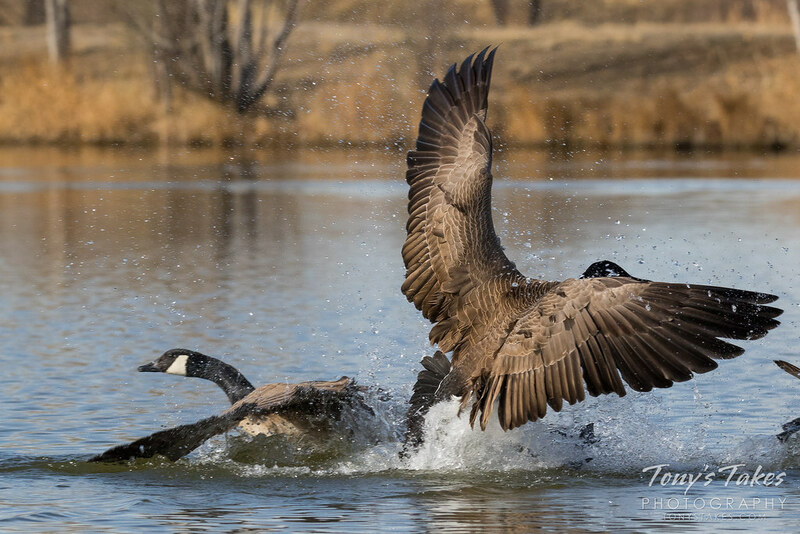 It comes flying in at another pair of geese landing right on top of another. As those two headed off for a different spot, the aggressor gave pursuit. 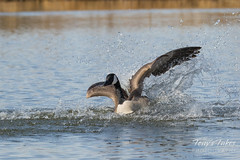 It was a pretty fun sequence and their aggressiveness was clearly on display as they prepare to mate and lay eggs soon. Taken at St Vrain State Park, Colorado. 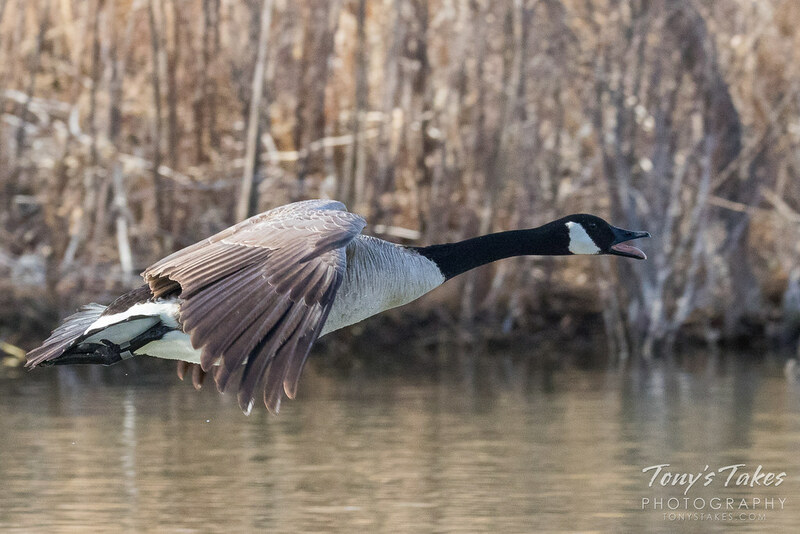 This little Canada Goose was quite the character. It and five of its siblings were following mom and dad around St. Vrain State Park, Colorado recently. 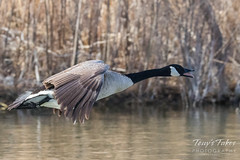 While the others were behaved, this one decided it wanted to practice the hissing that adult geese do when threatened. From one sibling to the next it would go up, open its mouth and stick out its tongue, and try to make the sound. Adults can be kind of mean and aggressive and if they hiss at you, you better give them some distance. Coming from this little one though, it was pretty comical. With Mom trying to lead her new family to water, her little ones were trying to figure out how to navigate their way across some very large rocks. It took them some time but in the end they were all successful. This is a good reminder for humans too – the obstacle in your life might be bigger than you but that doesn’t mean you can’t handle it with some perseverance! 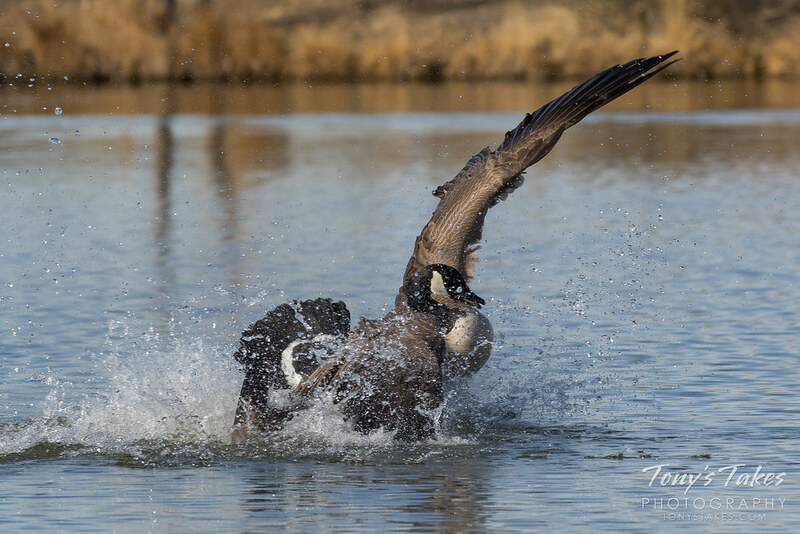 Canada Geese are not something I normally photograph – they are very common here and their numbers (and poop) can be overwhelming. However, when their goslings come along, I can’t help but snap pictures of the cute little ones. My willingness to take pictures of them was also aided by the cruddy, dark weather this weekend which made shooting my other, more ‘high power’ subjects difficult. This little one was Taken at St Vrain State Park, Colorado. A relatively uneventful and quick photo tour after work today. I was hoping this flock of geese would fly directly in front of the moon but they chose a higher altitude path. Nevertheless, kind of a neat image. Have a great evening, everyone!? 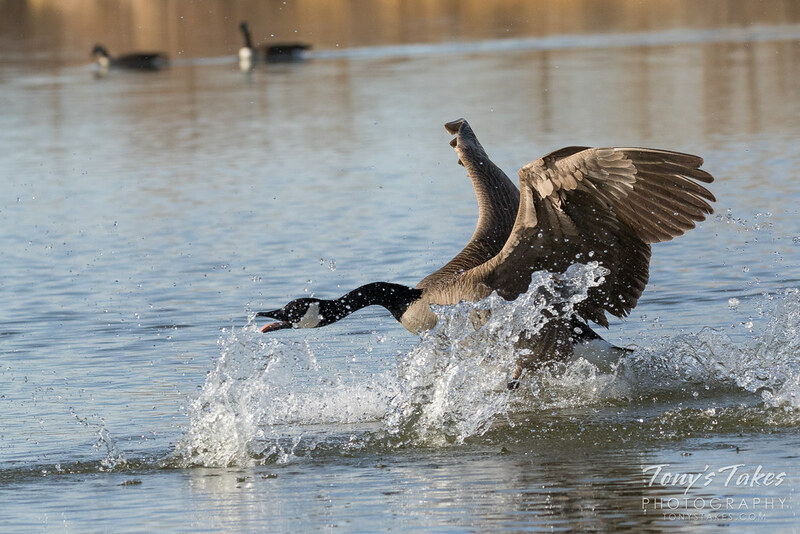 Northeast of Denver yesterday I watched huge masses of geese take flight. Wave after wave passed over, many landing in the nearby fields in such huge numbers they darkened the landscape. Most were Canada Geese but interspersed among them were small numbers of Snow Geese that stood out from the more dominant dark birds with their snow white plumage. 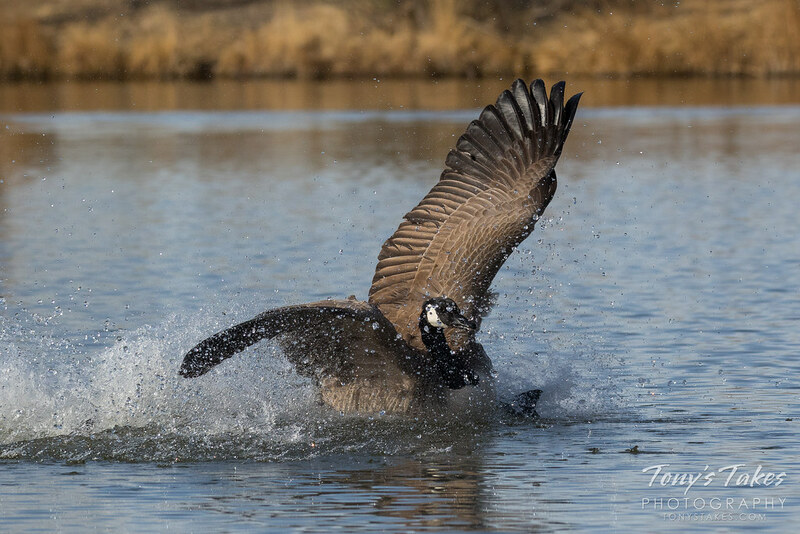 Here in Colorado, some Canada Geese are present year-round but during the winter their numbers swell as many migrate here for the colder months. Most locals tend to dismiss them and pay them little attention and oftentimes view them with disdain as they can be overwhelming (especially their poop!). Snow Geese on the other hand only stop briefly while migrating to and from their summer homes at the farthest north reaches of North America. Few stay in Colorado for any length of time so it is a bit more unusual and fun to see their gorgeous white forms when they fly over. This cute little one was quite fascinated with the guy on his hands and knees pointing a camera at it. 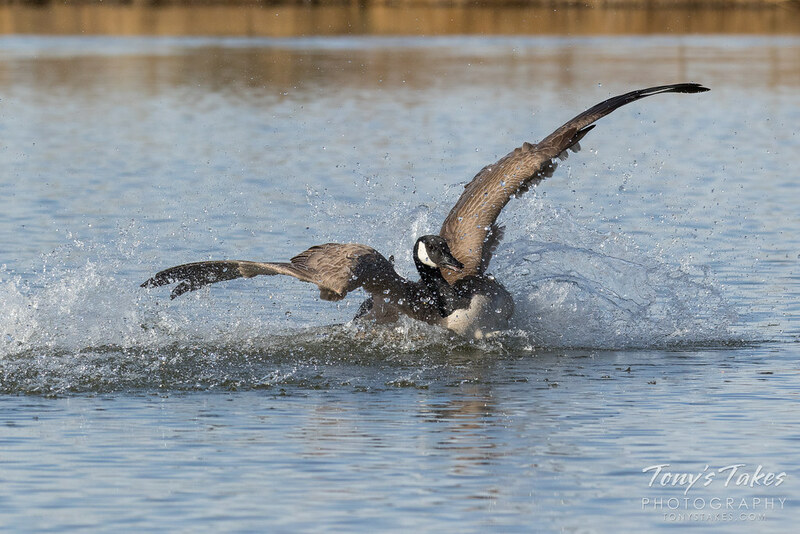 The back-lighting was a challenge but helped to illuminate the soft down covering the little Canada Goose. ? Everyone say, “Awwwww!” These little ones were not the primary target for today’s photo shoot but I couldn’t resist and took a ton of pics of them. They were milling around with their parents alternating between eating and resting. This particular little one seemed more interested in the ‘rest’ part. 😉 Taken at the Boulder County Fairgrounds in Longmont, Colorado.